Installs in any Mac Pro 2009. 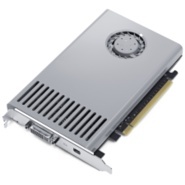 Some people have said that this card will work in the Mac Pro 2008. This part is NOT for the Mac Pro 2007. The NVIDIA GeForce GT 120 with 512 MB of GDDR3 memory delivers excellent all-around performance whether your playing games or dealing with creative and scientific applications. With up to four NVIDIA GeForce GT 120 graphics cards installed, a Mac Pro can support up to eight displays simultaneously. NVIDIA GeForce GT 120 includes two video ports: one Mini DisplayPort and one dual-link DVI port. This allows you to connect both the 24-inch Apple LED Cinema Display or another Mini DisplayPort-based display, and a DVI-based display such as the 30-inch Apple Cinema HD Display. Display adapters are available to connect VGA displays.